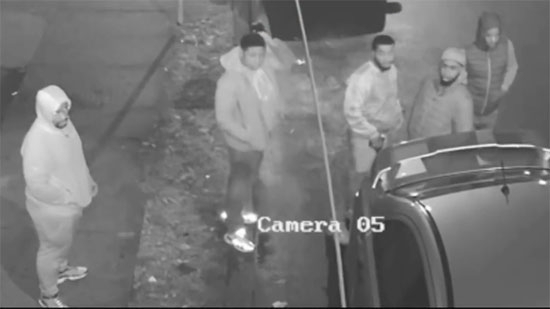 Philadelphia Police are searching for five individuals in connection to a murder last Friday in West Oak Lane. The shooting happened on Friday, 12/21, around 10 p.m. on the 2100 block of Middleton Street. The incident was caught on surveillance video. The persons of interest are all described as black males in their late teens/early 20s. They pulled up in a light-colored 2007 to 2017 Mitsubishi Lancer with a rear spoiler. It appears they were taping some sort of rap music video or social media post. After less than two minutes of their arrival, one of the males fired several shots at the victim who was walking past, crossing the street. Police say it was an unprovoked attack. If you have any information contact 215.686.TIPS (8477) or text a tip to PPD TIP or 773847. They are considered armed and dangerous. Parts of the Roosevelt Boulevard were shut down on Friday morning, 12/28, as crews fought a three-alarm fire at an auto body shop in the Somerton section. It happened around 8:45 a.m. on the 2000 block of Bennett Road in Northeast Philadelphia. The Boulevard was closed in both directions between Comly and Bennett for several hours. Four employees managed to escape. Firefighters could only fight the fire from three sides due to train tracks running on the backside of the building. They also had to run hoses to the other side of the highway to pull enough water. The underground water main stops at the train tracks. It took 121 firefighters over 90 minutes to bring it under control. There were no injuries. No word on the cause of the fire. Funeral plans have been announced for a South Jersey volunteer firefighter who died in a car crash while responding to a call early on Christmas morning. 21-year-old Natalie Dempsey lost control of her car and crashed into a guard rail on Landis Avenue in Mays Landing only a few hundred yards from the the Mizpah Volunteer Fire Company station. The cause of the crash is unknown. Services will be held at Absegami High School on Sunday, Dec. 30, from 1 p.m. to 4 p.m. She will be buried with Line of Duty honors since she was responding to a call at the time. Attendees are asked to wear blue. All firefighters are welcome.